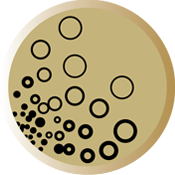 With the Gold Dust Dryer you’ll love the salon worthy result. Its ceramic grille and ion generator work together for frizz free shine and a professional looking finish with every use. Complete with a diffuser and concentrator the dryer allows you to adapt your blow dry to your mood or occasion. 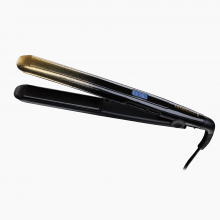 Start your hair style off with the gorgeous gold and black Gold Dust Dryer by Remington. Its features and attachments help you to tame and shape your hair, whatever its type, for a sleek, frizz-free result. The dryer features a ceramic grille for even heat distribution and a powerful airflow for fast drying. 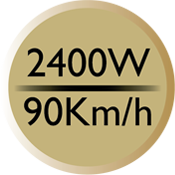 An ion generator produces 90% more ions* to help reduce static and control frizz, smoothing hair for a smooth, glossy finish. You can choose between 3 heat settings and 2 speeds to suit your hair type and style – these options give you the control to shape, and sculpt the look you want. Use the cool shot function to give your hair a final blast of cool air that’ll set your style. Whether you’re working ‘bed head’ tousles, playful curls or a poker straight style, the Gold Dust Dryer has two attachments to help you to create your perfect look. A diffuser is great for longer, curlier hair and a directional concentrator is ideal for straighter styles. It has a handy loop so you can hang it up and a 2.5 metre cord so you can use it comfortably. 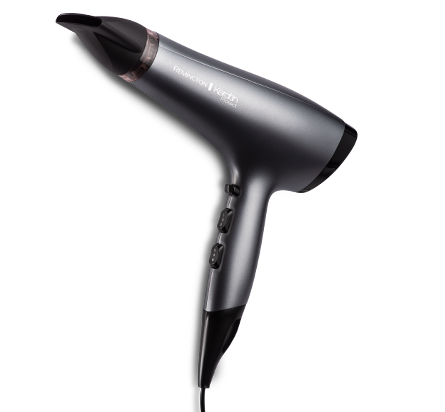 However you dry your hair, the beautifully designed Gold Dust Dryer performs to a salon standard for a professional looking finish every time. 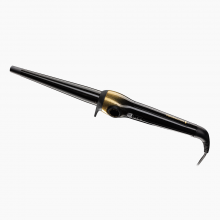 Whatever your hair type, the Gold Dust dryer has 3 heat settings and 2 speed settings to help you achieve the style you want. A Cool Shot setting gives your hair a final blast to set the style. 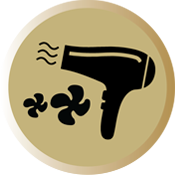 The Gold Dust Dryer generates 90% more ions* which helps to neutralise static for frizz-free shiny blow dry with every use.